Pablo Hidalgo Talks About the Star Wars Cartoon That Never Was. Dave Filoni reveals details on the final arc of Star Wars: The Clone Wars! 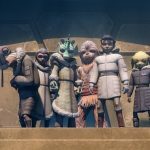 New Star Wars Rebels clip and images feature Yoda, Ahsoka, Anakin, and more! Today in Dubrovnik Star Wars: Episode VIII filming: Ridley’s double on her way & more! [Communauté] Evènement SWU Tout ce qu’il vous reste à savoir ! Hear the Full Version of “Jabba Flow” from The Force Awakens!